Wendy Cruz joined Brown Sims in 2016, as an associate attorney. She received her Bachelor of Arts from Georgetown University, majoring in Government. Ms. Cruz earned her Juris Doctor degree from St. Thomas University School of Law. While at St. Thomas, she was on the Dean’s List from Fall 2013 to Spring 2016 and received the CALI Book Award for Excellence in International Law and in Transnational Litigation. Ms. Cruz was also a member of the St. Thomas Law Review and President of International Moot Court. 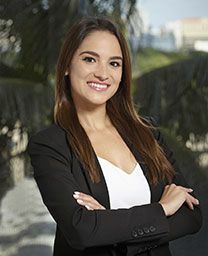 Ms. Cruz’s practice focuses on the defense of claims arising under the Longshore and Harbor Workers’ Compensation Act and the Defense Base Act, as well as complex litigation involving product liability, wrongful death defense, premises liability, and personal injury defense. Prior to becoming an associate attorney, Ms. Cruz was a Summer Law Clerk at Brown Sims.